Bees Cottage in Ancroft, near Holy Island sleeps 6 people. This charming holiday cottage, attached to the owner’s home, is thoughtfully furnished and decorated and has its own south facing garden. 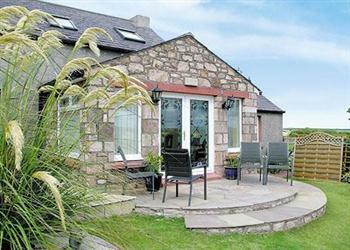 Just 6 miles from Holy Island, it enjoys views of the Cheviot Hills, with easy access to Berwick-upon-Tweed. The beach and golf course at Goswick, 4 miles. Bamburgh Castle, pretty coastal villages and Holy Island are easily reached, while Edinburgh and Newcastle are each an hour’s drive. Shops 6 miles, pub 2 miles. Ground floor: Living room with French doors/dining room. Kitchen. 2 bedrooms: 1 double, 1 twin. Shower room with toilet. First floor: 1 twin bedroom with sloping ceiling. Bathroom with shower over bath, bidet and toilet. Electric woodburner in living room included. Oil central heating and electric included (extra charge October - April). Bed linen and towels included. Cot. High-chair. DVD. Stereo/CD. Electric cooker. Washing machine. Fridge/Freezer. Enclosed garden with patio and furniture. Parking (3 cars). No smoking please. Holidays at Bees Cottage run from Friday to Friday. For a better idea of where Bees Cottage is, you can see Bees Cottage on the map below. Bees Cottage is in Northumberland; should you be on the lookout for a special offer, you can find all the special offers in Northumberland. It's always worth checking to see what is on offer at the moment. Do you want to holiday near Bees Cottage (18738), you can see other cottages within 25 miles of Bees Cottage; have a look to find your perfect holiday location.